The Edelrid OHM is an innovative, new solution for the problems experience by climbing partners with a significant difference in weight. What that means is the risk for a heavier climber if their lighter partner has difficulty controlling their falls, and the risk for a lighter belayer if they are pulled off the ground and hurled against the wall. This problem is particularly inherent within climbing couples, where men tend to be significantly heavier than women. You can, of course, use a weight bag to balance the weight difference, but they are highly impractical to take everywhere with you and restrict freedom of movement. Autoblocking belay devices also assist with braking, but without a weight bag, the belayer still faces a sudden pull and the leader a heavy fall. The Edelrid OHM is an assisted-braking resistor that increases rope friction, allowing the lighter belayer to safely catch falls. 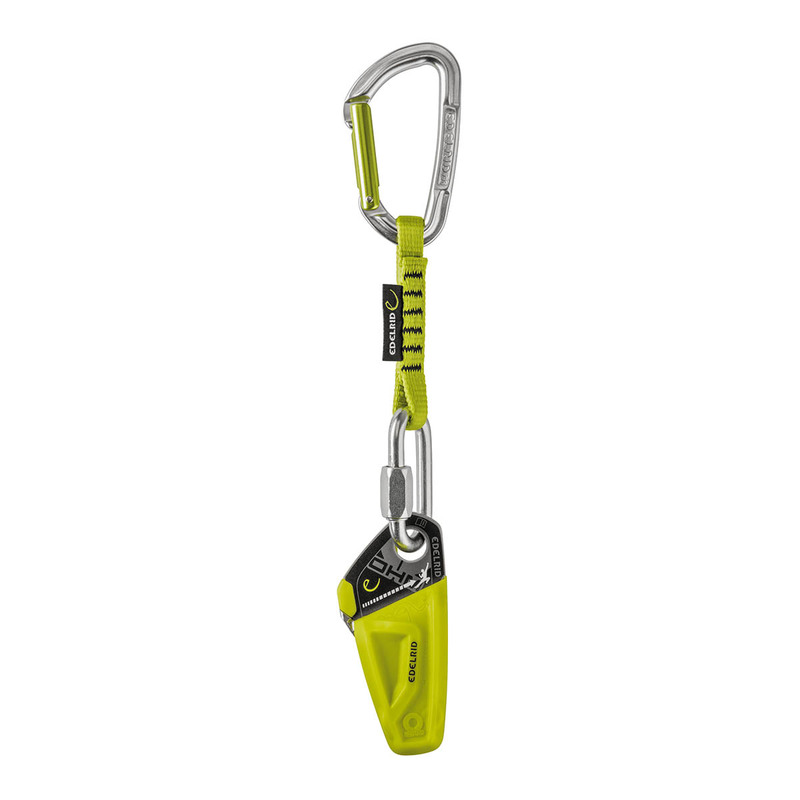 The climber attaches the OHM to their harness with the rope run through it, and, when they reach the first bolt, they simply clip the OHM to the anchor like they normally would a quickdraw. In the event of a fall, the rope is pulled into the device's braking mechanism, which reduces the braking force needed to be applied by the belayer and prevents them from being suddenly pulled off the ground, decreases the fall height of the leader, and allows for safe, dynamic arresting. The OHM is not designed to affect rope handling. It enables smooth paying out and taking in rope when climbing and belaying and has no negative affect on handling when used both in indoor gyms and for outdoor sport climbing. The OHM benefits both climber and belayer. The belayer can feel safe knowing they won't be hurt and have much more control of their partner's fall, and the lead climber can climb to their limits knowing they will not face a severely harsh fall every time they climb. Compact and light, the Edelrid OHM has been designed to be easy to carry and easy to use both indoor and out, so belayer and climber can perform to their full abilities without restrictions. Great device, easy to handle, better safe to guarantee the pleasure from climbing with your much lighter partner and concentrate on the rock details. I am a heavy dude and my best lead belayers are lighter than I would like for a belayer. That has always concerned and affected my mental game when leading. I sometimes don’t lead some higher grades because I don’t want to fall and kick my friends. I recently got this device and only tested in indoor. Amazing. It does not only prevent crushes with your belayer, but also soften the fall. It now gives me the confidence to climb harder without fearing a big fall. I bought this device to safely climb with my girlfriend. We have a 30+ kg weight mismatch. Before we got the Ohm, I did not feel at ease because it had happened that after a fall, I could see her in great difficulty being violently pulled against the wall. So I would usually climb something easier to have both feel safe. Now I am much more confident when I climb with her, and enjoy our gym sessions a lot. One recommendation is not to use it outdoor or whenever the line of the bolts is not approximately straight. Every review I could find on line failed to mention that this, and we had to learn it the hard way! Ohm will engage during the lowering, but if you sum that friction to the drag of the rope into meandering quickdraws (5-6 is already enough), it will be nearly impossible to get down. Highly recommended for the gym, not likewise outdoor. I’m a 96.5kg big guy who lead climbs with his 50kg super slim petite daughter. Before the Ohm she had to be attached to a heavy sandbag and use a Petzl Frieno carabiner to add friction to belay me. And even with this setup she was often struggling on her tip toes and still sometimes being lifted awkwardly with the bag attached and slammed into the wall if I fell. Well along comes the Ohm.... now there’s a 46.5kg weight diffence between us and she no longer needs a sandbag and hasn’t even been needing to click the rope into the friction gate of the frieno. She can now dynamically belay me (move around) allowing her to give or take slack by moving closer or away from the wall. She now trusts her GriGri+ in Lead-climbing mode to just handle it. As I said it’s a game changer and allowing with the GriGri+ amazing assisted breaking offers amazing confidence and safety. Unless I’m climbing with an equal or heavier belayer I will always climb with the Ohm. Yes it’s heavy (needs to be to not catch when climbing), but it’s built like a tank and just plain works and doesn’t use any cams or fancy parts. I know if I owned a climbing gym, there would be an Ohm installed on ever 1st bolt as a safety precaution. well, it allows me to climb with my 12 years old son :-) My weight is 75 kg while his about 40 and everything works fine. Sometimes OHM seems to be oversensitive (extremely overhanging walls, really high first clip) and you have to shake the rope to release it.